This article is about the city of Mandurah. For the local government area, see City of Mandurah. For the Northern Territory locality, see Mandorah, Northern Territory. Mandurah (/ˈmændʒərə/) is a coastal city in Western Australia, situated approximately 72 kilometres (45 mi) south of the state capital, Perth. It is the state's second-largest city, with a population just ahead of that of Bunbury. Along with four other local government areas (Boddington, Murray, Serpentine-Jarrahdale, and Waroona), the City of Mandurah is included in the wider Peel region. Mandurah is sometimes grouped together with Perth for statistical purposes, especially since the extension of the Kwinana Freeway and the completion of the Mandurah railway line in the late 2000s. The two cities now form a conurbation along the Indian Ocean coastline, although the Perth metropolitan area officially ends at Singleton. Mandurah has grown from isolated holiday communities along the shores of the Peel-Harvey Estuary to a major regional city in just over a decade, in a similar vein to the Gold Coast in Eastern Australia. In recent times, it has formed a conurbation with Perth along the coast; it is only 18 km south of Rockingham, a southern suburb of Perth. Mandurah has also become a popular lifestyle alternative for Perth retirees and its connection with the Perth CBD has been strengthened with the opening of the Perth-Mandurah railway line in December 2007 and a direct road connection to the Kwinana Freeway built by late 2010. A housing affordability survey of 227 cities in 2008 ranked it the least affordable city in Australia. The waters of the Peel Inlet and Harvey Estuary (one of Australia's larger inlet systems) form the centre of Mandurah. The estuary is approximately twice the size of Sydney Harbour. The city lies in and around this freshwater system which in turn feeds into the Indian Ocean. The city and its suburbs have many kilometres of ocean coastline most of which is sandy beaches. Mandurah also has a number of suburbs built around artificially created canal systems that extend from the Peel Inlet, such as Halls Head, Dudley Park and Wannanup. In terms of geology, much of Mandurah lies on the dune systems which dominate South Western WA's coastline, progressively grading towards the Swan Coastal Plain as one travels inland. The area has infertile soils due to the dunes being rather sandy, having poor water retention qualities. Limestone outcrops are found to the north of the city especially along the Mandurah Line. Mandurah is the closest city to Yalgorup National Park which is home to modern thrombolites as well as an array of flora and fauna. 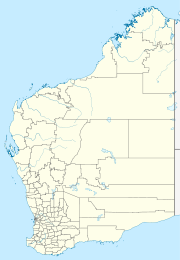 Mandurah is located in the Swan Coastal Plain ecoregion. The ecoregion contains an array of vegetation, from coastal dune and sandplains to banksia and eucalypt woodlands. Mandurah is covered by shoreline and dune deposits from the Pleistocene and Holocene that overlie Paleozoic and Neogene deposits of the Perth Basin. Coastal dunes feature scrub-heath communities, though banksia low woodlands occur on the soils of coastal dunes. Progressing inland give way to eucalypt woodlands. Seasonal wetlands (dry in the summer and wet in winter) are the most diverse habitat in the Swan Coastal Plain, which Mandurah has several wetland regions around the Peel Inlet. The wetlands feature several osprey nests, spoonbill and darters. Other fauna includes galah, short-billed black cockatoo, long-billed black cockatoo, and Australian ringneck among others. Australian ringnecks face competition for nesting space from rainbow lorikeet, an introduced species in Western Australia, that has now spread to Mandurah. Despite attempts to eradicate rainbow lorikeets, the population has grown to the point that they can no longer be eradicated. Mandurah is typically considered a marginal area for both major parties at both state and federal politics. Northern Mandurah lies in the safe Labor seat of Brand, held by Gary Gray, while southern and central Mandurah lies in the more marginal Canning, held by the Liberal Party's Andrew Hastie. State politics also highlight a significant divide, with northern and central Mandurah located in the safe Labor seat of Mandurah held by David Templeman, while southern Mandurah located in the safe Liberal seat of Dawesville, held by Zak Kirkup. Despite technically being in a regional area, the National Party vote is almost negligible. Sharing a similar climate to Perth, Mandurah has a typical Mediterranean climate (Köppen classification Csa) with hot dry summers and mild wet winters. During summer (December to February), the average maximum temperature is 27 °C (80 °F) with an average minimum temperature of 19 °C (66 °F). At its extreme it can get very hot, often having a couple of days exceed 40 °C (104 °F) in the latter half of summer. In winter (June to August), the average maximum temperature is 18 °C (64 °F) with an average minimum temperature of 9 °C (48 °F). Mandurah's proximity to the ocean moderates diurnal temperatures somewhat, with temperatures a few kilometres inland often 4 or 5 degrees warmer during summer days (or cooler during winter nights). Frosts are very rare as a result, but do occur annually around suburbs such as Greenfields. The current weather station opened in 2001 and is situated right on the coastline, causing data recorded to appear warmer during winter nights and cooler in summer days compared to surrounding areas. Mandurah also receives a moderate though highly seasonal rainfall of about 850 mm a year, however recent trends have seen this once reliable rainfall drop significantly. In addition, most of the winter rains are usually accompanied by severe winds and storms capable of causing widespread damage, making Mandurah one of the windiest cities in Australia. These conditions are perfect for tornado formation, which Mandurah's climate is remarkable for producing one of the highest densities of tornadoes in the world. Summer storms are rare due to the Mediterranean climate in the city, but not unheard of. Mandurah was affected to a lesser degree than Perth in the 2010 Western Australian storms, but the 2011-12 summer was notable for Mandurah bearing the brunt of three severe thunderstorms. One such storm on 12 December 2011 gave Mandurah almost seven times its monthly average (69.4 mm compared to an average of 15.5 mm), which was eclipsed exactly one year later on 12 December 2012 (74.2 mm). Another storm on 20 January 2012 dumped 57 mm on the city causing power outages and flash flooding. One man and numerous buildings in the city were struck by lightning during the storm, which produced 2,300 strikes within 30 kilometres of the city, which was more than what neighbouring Perth receives in an entire year and comparable to the most severe electrical storms for which places in the tropics like Darwin are known. The Noongar (or Bibbulmun) people, who inhabited the southwest of Western Australia, named the area Mandjar ("meeting place"). After European settlement the name changed, possibly due to mispronunciation, to Mandurah. In December 1829, Thomas Peel arrived in Western Australia from the United Kingdom with workmen, equipment and stores on the ship Gilmore. He had financed the trip in exchange for a grant of land in the Swan River Colony. A term of the grant was that he arrive no later than 1 November 1829, thus his original land grant was forfeited. Undaunted, Peel built a small settlement named Clarence south of the Swan River Colony at what is known today as Woodman Point. Facing many problems with the settlement and his own ill-health, Peel led the remaining Clarence settlers to the area known today as Mandurah. Soon after, other settlers also took up land in Mandurah including the families Hall (whose cottage at Halls Head is one of the region's most notable heritage places), Tuckey and Eacott. The census of 1837 records only 12 settlers at Mandurah, probably representing only 3 households. Thomas Peel died in 1865 but Mandurah continued to grow, albeit very slowly, over the years leading to the 20th century. Fish were abundant in the early years, and in 1870 a fish cannery was established at Mandurah. The population of the town was 160 (95 males and 65 females) in 1898. Mandurah was administered under the Murray Road Board until 1949, when the Mandurah Road Board was established. However, dissension within the board during the 1950s saw it suspended and Commissioner Richard Rushton oversaw the town's affairs. On 26 April 1960, the Mandurah Road Board was reconstituted, and on 1 July 1961, in accordance with the Local Government Act 1960, the Shire of Mandurah was founded. Industrial development at Kwinana(1955), a mining boom in nearby Jarrahdale (1963) and Wagerup (1984), with the associated industrial boom in Pinjarra (1963), combined with an idyllic lifestyle by the coast, saw Mandurah grow rapidly, and on 1 July 1987 it was upgraded to the Town of Mandurah. Three years later, on 14 April 1990, Mandurah became the fifth non-metropolitan settlement in Western Australia to become a city. Cooper's Mill (c.1843), Murray Terrace, Cooleenup Island, North Yunderup. Christ's Church (Anglican) (c.1870), 34-36 Pinjarra Road (corner Sholl Street), Mandurah. Peel's house site (1830), southern side of the corner of Mandurah Terrace & Stewart Street, Mandurah. Uniting Church (Former Methodist Church - 1940), 26 Sutton Street (corner of Gibson Street), Mandurah. Eacott Cottage (1830), 35 Gibla St Mandurah. Brighton Hotel (1882), 8-10 Mandurah Terrace, Mandurah. Little Theatre and site of the old Fish Cannery (aka Peel Inlet Preserving Works), 5 Mandurah Terrace, Mandurah. Sutton's Corner Store and house, Eureka Shops/Cottage (1862, 1928), 2 Mandurah Terrace, Mandurah. Tuckey Store & House & Slim Jim Cotton Palm, 1 Mandurah Terrace, Mandurah. Mandurah Museum (incorporating old school - 1900), corner Mandurah Terrace & Pinjarra Road, Mandurah. Mandurah Bridge (1894, replaced 1953, 2018), linking the town centre to Halls Head. Hall's Cottage (1833), 7 Leighton Place, Halls Head. Sutton's Farm (1860s), Apollo Place & Picaroon Place, Halls Head. Sutton's graveyard (1860s), corner Finistere Island Retreat & Picaroon Place, Halls Head. Allandale Homestead (Dawes House - 1913), Lot 102 Estuary Road, Dawesville. Herron Homestead (1866), Lot 85 Quail Road, Herron Lake, Clifton. Hardy House (c.1853), 860 Estuary Rd Mandurah. Fouracres Cottage ruin (c.1854), west side of Old Coast Road between Peppermint Grove and Coronation Roads, Waroona. Much of Mandurah's economy is based on tourism, retail and manufacturing/construction, and to a lesser extent on mining and agriculture. Mandurah is considered to be the unofficial gateway to the South West and possesses a variety of tourist attractions, especially based around the water. It is a major fishing and crabbing area in Western Australia, with the city well known for the blue manna crab (Portunus pelagicus) with a festival held in early March known as Crabfest. Like neighbouring settlements Bunbury and Rockingham dolphins and whales frequent the city annually and dolphin and whale watching are a popular pastime. In December, the canal areas in Mandurah becomes well known for their Christmas lights and special boat cruises are often promoted as a result. Mandurah has year-round seven-day trading . Mandurah has five distinct shopping areas, including Mandurah Forum located at the intersection of Pinjarra and Mandurah Roads, The Bridge Quarter (or The Foreshore) located in the CBD and Dolphin Quay/Mandurah Ocean Marina built at the intersection of Mandjar Bay and the Peel Inlet. There are also smaller retail areas in Meadow Springs, Greenfields, Halls Head and Falcon. Although not a mining settlement, Mandurah has a number of mines within two hours of the city. This includes bauxite mining and alumina refining at Pinjarra and Wagerup with the Huntly Mine at Pinjarra the largest in the world. Mandurah is also just one hour away from the Boddington Gold Mine, which has recently become Australia's largest producing gold mine. Every New Year's Eve, there are fireworks and live entertainment and activities. throughout the midnight. Highway 1 bisects the city of Mandurah as Mandurah Road towards Fremantle and Old Coast Road towards Bunbury. Meanwhile, Pinjarra and Gordon/Lakes Roads serve as major east-west corridors for the northern part of the city. The Kwinana Freeway and Forrest Highway also provides a rural bypass for the city. Mandjoogoordap Drive (formerly the Mandurah Entrance Road) also provides a direct link from the Kwinana Freeway. The Mandurah Estuary Bridge was constructed in 1985 to 1986, and was the first incrementally launched box girder bridge in Australia. The Dawesville Channel (also known as the Dawesville Cut), a large man-made channel, was opened in April 1994. The channel was created to allow saline seawater from the Indian Ocean to flush into the Peel Inlet to reduce the incidence of algal blooms which had plagued the estuary for many years. Public transport in Mandurah is covered by Transperth due to its proximity to Perth itself, with eleven bus routes servicing the city while the Mandurah railway line, opened in December 2007, links Mandurah to Perth via Mandurah railway station with a travel time of approximately 50 minutes. Mandurah is also a stop on Transwa bus services between Perth and the South West. Mandurah lies at the southern end of the Perth TV licence area, and is close to the regional Western Australia licence area. Local translators provide five digital free to air networks from Perth: ABC, Seven, Nine, Ten and SBS and three networks from southern Western Australia: SSW, WIN and SDW. Perth's community television station, West TV, does not have a translator in Mandurah. Two local newspapers service the city, the weekly Mandurah Coastal Times and the Mandurah Mail. Mandurah is served by two local, independent radio stations, Wave FM (91.7FM) and Coast FM (97.3FM), along with some spill over from the Perth radio stations. Mandurah is at the centre of a water recycling project known as the Halls Head Indirect Water Reuse Project. Based in Mandurah, it has been awarded the Western Australian Water Corporation Award for Water Treatment and Recycling in 2009. An aquifer is used to filter the area's sewage water providing safe, quality irrigation water for local parks, gardens and ovals. Mandurah is also linked to Perth's water supply. Mandurah is home to the Peel Thunder Football Club in the West Australian Football League, Mandurah City in the Football West State League and the Pirates Rugby Union club in the RugbyWA competition. Greyhound racing is held weekly at the Greyhounds WA Mandurah venue. Mandurah also hosts the Mandurah Magic of the State Basketball League at the Mandurah Aquatic and Recreation Centre. There are several golf courses in the area including the Mandurah Country Club, Meadow Springs Golf Club, Secret Harbour. Mandurah is a private, tree lined course. Meadow Springs is a public course inhabited by kangaroos. Secret Harbour is a public links course near the beach. One club, The Cut, was rated 4th best golf course in Western Australia and 30th nationally in 2015. The Mandurah area boasts family friendly beaches such as Doddis Beach, Blue Bay and Mandurah Beach and surf beaches around Wannanup and Dawesville such as Avalon, 4th Groyne, Giri's, Pyramids and The Wedge. A photograph of Mandurah adorns the cover of the 1986 album Born Sandy Devotional by The Triffids. Electro pop duo Tim and Jean hail from Mandurah. Mandurah was featured in the 1986 film Windrider, starring Nicole Kidman. ^ Australian Bureau of Statistics (21 June 2012). "2011 Census Quickstats: Mandurah". Archived from the original on 16 May 2013. Retrieved 28 September 2012. ^ Maiden, Samantha (21 January 2008). "Australian homes the world's least affordable, survey says". The Australian. Archived from the original on 21 January 2008. ^ "Southwestern coast of Australia | Ecoregions | WWF". Worldwildlife.org. 10 October 2001. Archived from the original on 30 April 2013. Retrieved 22 April 2013. ^ "Australian Ringnecks". Beautyofbirds.com. Archived from the original on 6 May 2014. Retrieved 22 April 2013. ^ "Home". Inflowimages.com. Archived from the original on 28 September 2011. Retrieved 30 November 2011. ^ Zadnik, Alex. "Storms strike Western Australia". Weatherzone. Archived from the original on 21 January 2012. Retrieved 21 January 2012. ^ "Lightning Storms in the Top End". Australian Broadcasting Corporation. 10 December 2002. Archived from the original on 6 July 2008. Retrieved 27 July 2008. ^ "Significant Weather – January 2002". Bureau of Meteorology. Australian Government. Archived from the original on 8 June 2007. Retrieved 28 June 2011. ^ "Climate statistics for Mandurah". Australian Bureau of Meteorology. Archived from the original on 5 September 2008. ^ Hasluck, Alexandra; Thomas Peel of the Swan River, Oxford University Press, 1965; pp.50-70. ^ Richards, Ronald; Mandurah and the Murray: A Short History of the Old Murray District of Western Australia 1829-1900, Artlook, 1980; p.21. ^ "POPULATION OF WESTERN AUSTRALIA". Western Mail (Perth, WA : 1885 - 1954). Perth, WA: National Library of Australia. 22 April 1898. p. 23. Retrieved 31 May 2012. ^ "BP Refinery (Kwinana)". Kwinana Industries Council. Archived from the original on 13 November 2015. Retrieved 13 November 2015. ^ "Bauxite Mining". Alcoa, Inc. Archived from the original on 16 November 2015. Retrieved 13 November 2015. ^ "History of Wagerup Refinery and Willowdale Mine". Alcoa, Inc. Archived from the original on 16 November 2015. Retrieved 13 November 2015. ^ "Pinjarra Refinery". Alcoa, Inc. Archived from the original on 16 November 2015. Retrieved 13 November 2015. ^ "History of Mandurah". Mandurah.wa.gov.au. 25 March 2010. Archived from the original on 15 September 2012. Retrieved 30 November 2011. ^ WA State Heritage Office, Heritage Place No. 1771. ^ WA State Heritage Office, Heritage Place No. 1489.; Williams, V.; A brief history of Christ’s Church Anglican, 1992. ^ WA State Heritage Office, Heritage Place No. 3064. ^ WA State Heritage Office, Heritage Place No. 1484. ^ WA State Heritage Office, Heritage Place No. 3065. ^ WA State Heritage Office, Heritage Place No. 1486. ^ WA State Heritage Office, Heritage Place No. 3074 & 24859. ^ WA State Heritage Office, Heritage Place Nos. 3066, 17173 & 17174. ^ WA State Heritage Office, Heritage Place Nos. 3073, 24392, 24415 & 24482. ^ WA State Heritage Office, Heritage Place No. 9079. ^ WA State Heritage Office, Heritage Place No. 9083; The West Australian newspaper of 3 February 2016 reported that the old timber bridge would shortly be replaced by a new concrete bridge but part of the old bridge would be retained "as a feature within the water on the western side and a section will be retained on the eastern side to be incorporated into the fishing platforms and boardwalk." ^ WA State Heritage Office, Heritage Place No. 01485. ^ WA State Heritage Office, Heritage Place No. 3078 & 24454. ^ WA State Heritage Office, Heritage Place No. 3078 & 24425. ^ WA State Heritage Office, Heritage Place No. 3077. ^ WA State Heritage Office, Heritage Place No. 9070. ^ WA State Heritage Office, Heritage Place No. 3817. ^ WA State Heritage Office, Heritage Place No. 3093. ^ "Mandurah Forum". Mandurah Forum. Retrieved 16 November 2013. ^ Rebecca Le May. "Boddington gold mine to eclipse Kalgoorlie Super Pit | Latest Business & Australian Stock market News". Perth Now. Archived from the original on 16 April 2012. Retrieved 30 November 2011. ^ "New Years Eve Celebrations". What's On - Major Events - Calendar. City of Mandurah. Archived from the original on 2 September 2017. Retrieved 2 September 2017. ^ "Mandurah News, sport and weather - Mandurah Mail". www.mandurahmail.com.au. Archived from the original on 23 March 2018. Retrieved 7 May 2018. ^ "Making green fields from waste water". CSIRO. 7 July 2005. Archived from the original on 6 September 2006. Retrieved 16 November 2013. ^ "Greyhounds WA Mandurah". Greyhoundswa.com.au. 1 October 2010. Archived from the original on 15 February 2012. Retrieved 30 November 2011. ^ Steph Hughes (21 November 2009). "Tim & Jean: Home and Hosed". Archived from the original on 8 February 2011. Retrieved 2 February 2011.